Although I've been baking sourdough whole wheat sandwich bread for a few years now, I've been yearning to try something new, something that might evoke memories of the beautiful baguettes I had eaten as a teen in France, but a bit more nutritious. This is my first recipe to post here, and thought I should share it since I posted a comment on Shiao-Ping's recipe that I tried it for the first time, and it was a bit sour and "whole-wheaty". 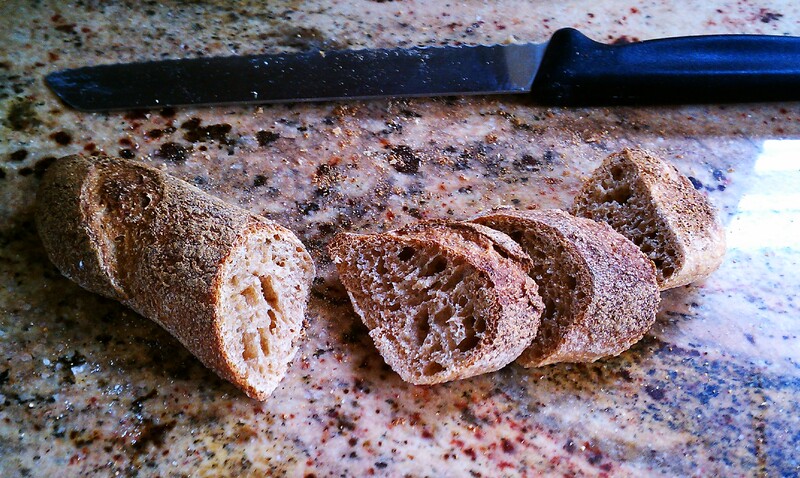 I also commented similarly on Mick's blog post about this bread. Happily, however, this second attempt did not turn out sour at all! This time I also tried to approximate the ratio of hard spring wheat to soft pastry wheat that is given in the Laurel's Kitchen Bread Book recipe for French Bread. Unfortunately (or maybe fortunately), I miscalculated and added wayyy too much pastry wheat (about 130g extra, and about 30g less hard wheat than I meant to), but it still came out great! Maybe it didn't rise as much as it would have otherwise (only one loaf sports the coveted "grigne"), which is why I will try again with the correct calculations, but this was delicious so I just had to post it. Maybe it's nothing that a little more practice at shaping and slashing won't fix anyway. Day 1, PM: Feed a tablespoon or so (25g?) of cold starter with 50-60g or 2 oz. Hard Red Spring Wheat flour, and an equal weight of water (i.e. 100% hydration, in baker's percentages). Leave out, covered, overnight. Day 2, AM: Feed starter again, this time doubling the weights of water and flour, to arrive at somewhat more than the amount of starter required for the recipe. Leave out again, covered, until evening. Day 2, PM: Combine all ingredients listed above but the salt, autolyze (rest) for 20 minutes, then add salt and mix for 1-2 minutes (I used my KitchenAid mixer with dough hook for just a minute or so). If it comes clean from the mixing bowl, may need to add a little more water, or just wet your hands whenever handling the dough from here on out. Cover and place in fridge. Day 3, AM: Take dough out, stretch and fold once on a wet counter, then replace in covered bowl in fridge. Day 3, PM: Sometime in the early evening, depending on your schedule, take the dough out of the fridge. Over 4-5 hours, stretch and fold once per hour, storing covered, out of the fridge, in the meantime. Finally, shape* and proof for 45 minutes to 1 hour and return, covered, to fridge. Day 4, AM: Take out of the fridge and bake. I poured 1 cup of boiling water into a preheated enameled dutch oven (minus the lid) on the bottom rack of my oven, and a preheated baking stone with cornmeal sprinkled on it on a rack in the top third of the oven, the baguettes baking directly on top of it. First, stretch the dough out into a roughly oblong shape about the size of a large book. Use a straight-edged dough scraper to cut (with even downward pressure, rather than sawing) the dough into two rectangles. Rest for 5 minutes, then cut each half into long thirds (or quarters, depending on how large you want your baguettes, I think I did quarters to end up with shorter baguettes). Take each strip and proof on an inverted cookie sheet with lightly floured parchment or silicone mat. Cover with tea towel, putting wrinkles of cloth between the baguettes so they don't run into each other, cover with a large food-grade plastic bag, and refrigerate. The next day, when preheating is almost done, remove from fridge and turn the strips over, optionally paint with water, and then slash. Looks fantastic. I've made Rhinehart's (yeasted) Pain a l'ancienne before and was really pleased with it, but would definitely be interested in having a go at a whole wheat sourdough version. Did you get around to trying again with more water?